I will say here that this pizza dough has a lot of butter in it, 2 sticks to be exact. Now, I believe that fat isn’t necessarily bad. I do believe that the wrong kinds of fats are quickly degrading our health. However, organic butter from grass-fed cows (preferably) is actually very healthy for you! On the other hand, hydrogenated oils such as the ones found in margarine are the ones that are creating great health problems. This of course is really another subject, so for now, let’s stick to the pizza. Of course, if you’re allergic to casein or can’t eat butter, this may not be a great recipe for you. I did consider trying it with palm shortening, but haven’t got that far. 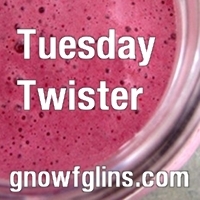 I would also like to try it without yogurt and use apple cider vinegar water instead for the dairy-free version. I’ll keep you updated on this. On another note, don’t be surprised if this doesn’t taste like your normal pizza crust. Since it’s torte style, and has 2 sticks of butter in it, is has a very buttery, dense taste and texture, similar to pie crust, only thicker. I actually didn’t like it at first because it was quite different from the normal yeasted pizza crust. But don’t let this keep you from trying this. After my first piece, it started to grow on me. And within two days, the two pizzas were devoured by our family of three. 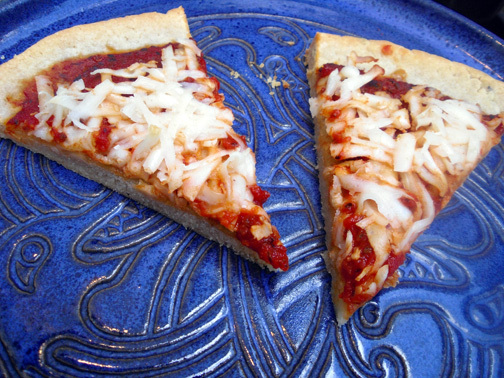 The other thing I loved about making this recipe is that it is a roll-able and knead-able gluten-free pizza dough recipe. With most gluten-free pizza dough recipes, you end up with a wet, cake-like batter that needs to be spread with a spatula. I personally love kneading bread and getting my hands a bit dirty and feeling like I am creating something with my hands, rather than a machine doing the work for me. It also has a most amazing scent as you knead the dough. Let’s not leave out the fact that this is also a yeast-free pizza dough. For those who are gluten-free and yeast-free but who can have a bit of dairy in the form of yogurt and butter, this may be a really great recipe for you. As for the toppings, this is completely up to your imagination. I stuck to the traditional pizza sauce with cheese for this one and I used almond cheese. It didn’t melt like I would have liked but it was still a good addition. Other ideas might include pesto sauces in place of pizza sauce, vegetables like mushrooms, tomatoes, artichoke hearts, olives, or meat such as seasoned ground turkey, beef or lamb. 1. Cream the yogurt and butter together with a hand mixer. Add the flours, xanthan gum and salt and continue to mix until well combined. (I actually used my hands for the second part and it was very fun. There is something about using your hands directly, especially when you’re making bread.) Cover with a towel and let sit at room temperature over night or 12-24 hours. 2. Scrape dough out of the bowl and pat into a ball. Cut into two pieces. 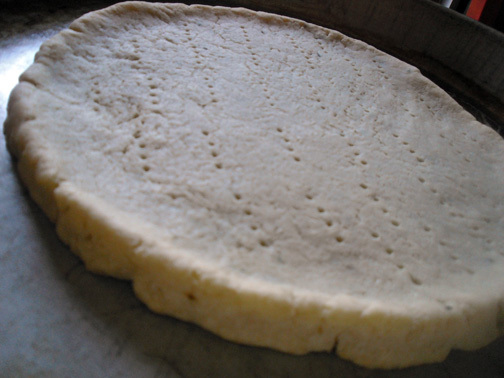 Flour a counter or large cutting board with arrowroot powder. Form each half into a ball and then roll into two 10” rounds. Transfer to an oiled pizza pan and then finish the edges to make the crust. Prick crusts well with a fork. 3. Prebake pizza crusts at 300 F for 30 minutes. 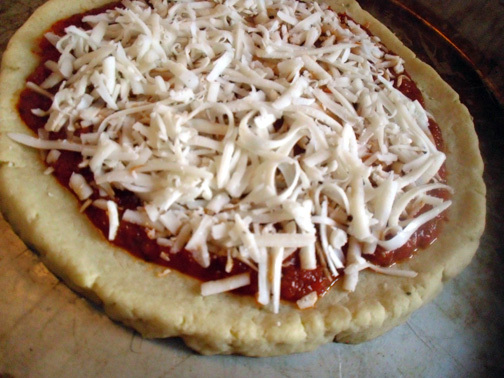 Add your toppings, then bake again at 350 for 30 minutes or until crust is baked through and the cheese melts. I hope you enjoy this new gluten-free pizza crust. Please let me know how it goes for you and how you like it! Hi! The pizza crust looks terrific! I have been wanting to do more baking with soaked flours—especially gluten-free flours—but I am not sure how to adjust some of my recipes to accommodate the extra moisture. Do you have any tips or a good rule of thumb? Basically what I’ve been doing is using soaked recipes in Nourishing Traditions as guides while I convert other recipe to be soaked and/or gluten-free. For the muffin recipe, I increased the flour by 1/2 cup. After it soaked, it was still very wet so I ended up adding 1/2 cup flax meal and 3/4 cup coconut. This seemed to turn out really well. I also added xanthan gum to make sure they would stick together. For the pizza recipe, I followed the recipe almost exactly except I made up a gluten-free blend for the flour based on previous experience with gluten-free pizza dough. I’d like to try some other types of flours to see how they work with this recipe. So I would look at the recipes in NT and use them as a basis for your converting in terms of how much wet and dry ingredients to use. But you may still need to adjust it a bit more to make it work out to be gluten-free. Good luck and please let me know how it goes. Thanks so much for hosting! I too loved the fact that I could roll the dough and finish the edges. See you next week! I wonder if you could sub coconut oil for the butter, to make it dairy-free? It sounds good! I think this may work – if you give it a try, can you let me know how it goes? Another thought is coconut butter – which is the meat and the oil of the coconut blended together. It is very delicious but more expensive than coconut oil. I love the Artisana brand. I think this would make the crust a bit sweeter than with the butter. For the soaking, you can try using either lemon juice with water or apple cider vinegar with water (about 1 Tbsp to a cup of water). I just made it tonight and it was delicious. I made 1/2 a recipe and it still made 2 decent size thin crust pizzas (probably 10″ or bigger). Being CF I soaked it in coconut yogurt which was pretty thick so I wound up adding 2 tbsp or so of water to bind the dough. Very easy to work with, tasted great. Definitely a keeper ! This looks fantastic! I’ve been looking for a dough I can roll so that I can make pizza bread. Do you think this recipe would work and if so, what changes should I make to bake it well and thoroughly? I’m wondering if I should increase time or temperature. Thanks so much! I was planning on rolling the dough up jelly roll style with pepperoni and cheese inside. Then backing it seam side down on a jelly roll pan. It’s really hard to say when you are changing a recipe. I would just do what you said, maybe increase the baking time a bit while keeping an eye on it. But it is really an experiment so good luck! Let me know how it turns out if you do it. thanks!